The Cherokee language is similar in some ways to the Iroquois family of languages. Each word can convey the meaning of an entire sentence. Cherokee is similar in some ways to the Iroquois family of languages, causing some to group it with them. 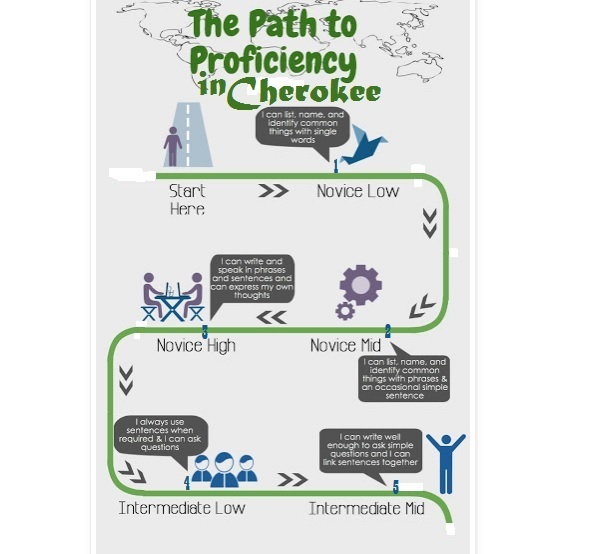 Others have demonstrated that Cherokee is distinctive enough to not fit in any other category and to stand alone among languages. Cherokee is a 'polysynthetic' language, which means that words are formed with a root, one or more affixes (always has a prefix) and a suffix. A Cherokee word can thus be very long and can mean what actually corresponds to an entire sentence in other languages. So get over thinking that you are learning words. You are actually learning sentences! Each community will have its own unique way of saying a sentence and that sentence becomes the agreed upon meaning of a word. Other communities may understand the "word-sentence" but they may not use the same "word-sentence" when speaking. Historically, the Cherokee homeland covered the entire southeastern portion of the present day United States. As the people were forced to live closer and closer to one another, and as entire populations of communities died from disease and refugee camp level living conditions, the dialects were forced to interact more closely with one another and some shifts occurred. Oklahoma- often called the "western dialect" and it has the most speakers. Robbinsville or "Snowbird"- sometimes called the "eastern dialect" Western and Snowbird share more similarities with each other than all other eastern dialects do. It has the 2nd most speakers of all the other dialects. Yellowhill- which also claims the title of "eastern dialect". Yellowhill and Snowbird have some similarities. Big Cove- which is sometimes also referred to with the title of "eastern dialect" which actually has two variations of dialect, one which NEVER uses one entire line of syllabary, and another which uses the entire syllabary. There are no cognates between English and Cherokee, however, there are some "borrowed" words that have come into use such as the word for watch "Wah chee" from the English and "Wa ga" from the Spanish for Cow (Vaca).When a word is "Borrowed" the last syllable of that word is always a rising tone. Every word in Cherokee is a sentence. Each "word-sentence" that is very descriptive. The word for "Wa-Ya" which is universally recognized to also mean "wolf" is a sentence which states "He is carrying the long rigid item". As is the case for all languages, Cherokee continues to evolve, and when loan words are not used, new, highly descriptive words are created. Cherokee is a very literal language. The polysynthetic nature of the Cherokee language enables the language to develop new descriptive words in Cherokee to reflect or express new concepts. One final example here is ᏗᏓᏂᏱᏍᎩ (didaniyisgi) which means "the final catcher" or "s/he/it catches them finally and conclusively." This is the Cherokee word for "policeman." The written language and pronunciation are something else again and can be read about in several of the books on the language that are available, however nothing is as helpful as actually HEARING it spoken. CHEROKEE IS A TONAL LANGUAGE. 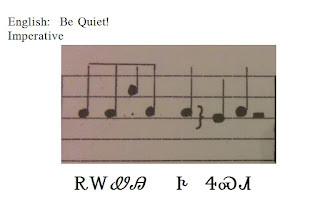 In a tone language (tonal language), different tones (like in music, but not as many) will change the meaning of the words, even if the pronunciation of the word is the same otherwise. English and almost all other European languages are not tone languages at all. This really complicates things for those who either learned English First or learned the languages together (bilingually) and some fluent speakers have commented that the bilingual folks never really seem to get the tone correct. One of the best ways to indicate tone is to write out each word on a music staff in musical notation. This helps more folks to start to get it right. If you want to learn the language you need to commit yourself to spending TIME to learn it. TIME speaking it either into a recording of yourself (Audadicity is free for your pc) or speaking to others. You will have used your time well to fulfill the necessary 5,000+ hours that it takes to learn this language. DON'T LET THIS SCARE YOU OFF! Will you START NOW and look back 5 years from now and be GLAD you did?! Will you put it off and look back 5 years from now and WISH you had started? Stop using English for SOUNDS- sound swap! 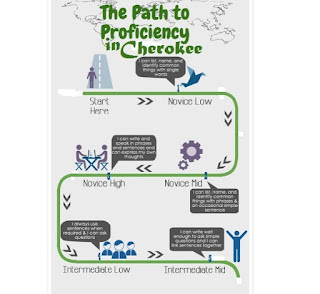 A super quick way to start speaking Cherokee and to start grasping the mindset of the language is to start replacing your English (or primary language) with Cherokee words and sounds. Ever needed a "jump start" on your car or truck? Well, onomatopoeia's can become a "jump start" for your language! It is a poetic way of describing a sound or can identify an animal or object with a sound. The Greeks coined the word and the Latin borrowed it. Our English is Latin based. Story tellers and Poets often use onomatopoeia to access the reader’s auditory sense and create rich soundscapes. We have an entire unit theme on ONOMATOPOEIA's we have collected from various sources including old documents, books, and even speakers who were willing to share with us. we will give you a FEW just to get you jump started! Remember, this is NOT a complete list of all the Cherokee onomatopoeia's (ᎤᏃᏴᎬ ᎠᏰᎵᏍᎩ) but it is a BEGINNING LIST. Start using these in everyday life first. (also, Drum sounds!) pa rum pa pum pum E, E,E, E, E! but you can START right now by replacing your everyday English sounds with these CHEROKEE sounds instead! Especially when you are telling BEDTIME STORIES to your children!